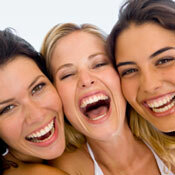 Don’t let tooth decay, erosion, or wear prevent you from having the beautiful smile you deserve. At Dental Health Care Associates, we commonly use composite resin restorative material as an effective treatment for all of these issues, using only the safest and most-trusted materials. Our composite resin fillings are made to match the colour of your tooth, providing an aesthetically-pleasing solution that is also very long-lasting. This type of filling requires less natural tooth structure to be removed during preparation than a traditional silver amalgam filling, meaning that the procedure can often be completed in a single appointment. Because of their many benefits, patients are also choosing to replace their existing silver fillings with composites. These fillings are developed by combining resin material with hard plastics, silica and quartz, producing highly-durable results. They are placed in layers and hardened with a specially developed curing light before being sculpted to the contour of your tooth. The last step in this process involves buffing the material to a tooth-like translucency to create a natural appearance that blends in seamlessly with the rest of your teeth. Do you have an old amalgam filling that needs replacing or are concerned about tooth decay? We believe in restoring your smile to its most beautiful condition and our composite resin fillings are the perfect procedure to achieve this. Contact 03 9650 2909 today to schedule a consultation with our dental team!